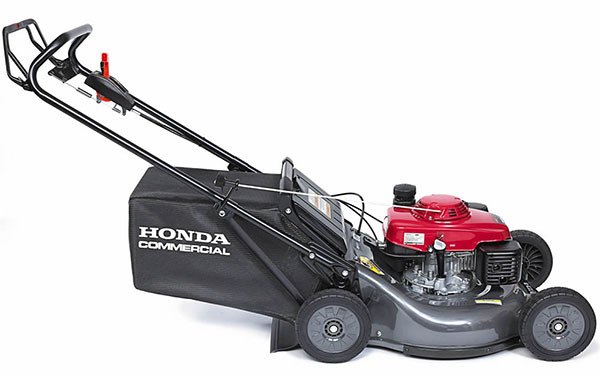 Tough, powerful mowers for commercial cutters. PRECISION SPEED CONTROL: COMMERCIAL HYDROSTATIC CRUISE CONTROL: This durable commercial transmission offers infinitely variable speed control from 2.1 - 4 mph. 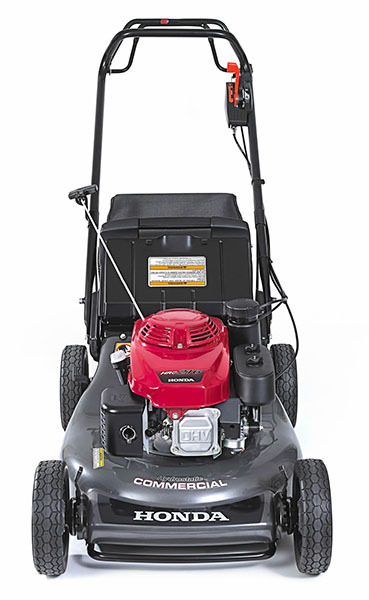 Allows you to change and maintain the ground speed to match mowing conditions. 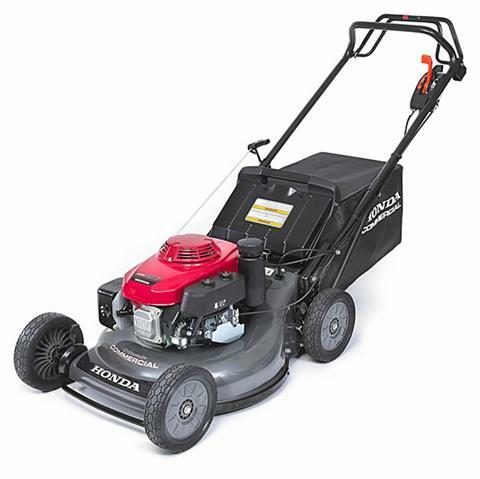 HONDA COMMERCIAL-GRADE GXV160 OHV 4-STROKE ENGINE: The easy-starting, powerful, and quiet GXV160 commercial engine is designed for superior reliability. Features include a cast iron cylinder sleeve, two-stage air filter, ball bearing supported crankshaft, electronic ignition and mechanical governor. The GXV160 is 50-state certified to meet EPA and CARB emission levels. 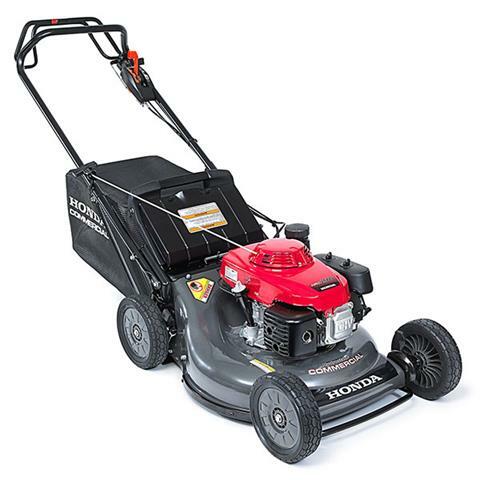 HONDA MICROCUT® TWIN BLADES: SUPERIOR MULCHING AND BAGGING: Honda's exclusive MicroCut® twin blade system uses four cutting surfaces that result in ultra fine clippings for superior mulching and bagging. Tiny pieces mean up to 30% more clippings in a bag, plus better mulching – saving you time and money. RUGGED, DURABLE STEEL DECK: The 21 in. heavy duty steel deck is rugged and built to last. Deck guards extend along the sides to increase durability. FRONT BUMPER: Provides protection to the deck, as well as a convenient tie-down location. The front axles & the bumper together give added structural stability and durability. MAINTENANCE FREE SHAFT DRIVE: An automotive style drive shaft transfers power from the engine to the hydrostatic transmission. Shaft drive is a more efficient transfer of power. And because there are no belts to slip, break or adjust, it’s maintenance free. HEAVY-DUTY REINFORCED HANDLES: Larger diameter 1 in. tubing, better supports and stays, and more durable cables. 8 MOWING HEIGHTS (3/4 - 4 in. ): Suitable for all grass types. LARGE 9 IN. NEXITE® WHEELS: Strong, lightweight, and easy to replace when necessary. PRECISION SEALED BALL BEARINGS IN ALL FOUR WHEELS: Increases durability and performance. Plus better maneuverability and a smoother ride. LARGE, 2.5 BUSHEL EASY-EMPTY GRASS BAG: Holds more grass, so you can empty it less often. FLYWHEEL BRAKE SAFETY SYSTEM: Stops the brake when you let go of the handles. FULL THROTTLE CONTROL: The engine speed can be reduced to idle while emptying the grass bag. QUALITY CABLES: Cables are heavy duty, sealed, and adjustable for maximum performance and durability. DUAL ELEMENT AIR CLEANER: Provides maximum protection, even in the dustiest conditions. The outer foam can be repeatedly cleaned, which extends the life of the air filter.